Arthur Boitte was a Belgian publisher company based in Belgium (169 rue de Flandres, Bruxelles) and in France (4 rue Boulard, Paris 14e) where it was managed by Mr. Fuss-Amoré. The company was active at least between 1882 and 1917. Arthur Boitte published a newspaper called La feuille Littéraire (The Literary Leaflet). Published every two weeks for 10 centimes, it was designed (8 pages) to give a whole view of an author works, mostly french such as Alfred de Musset, C. Flammarion, Honoré de Balzac, Beaumarchais, Eugène Sue, etc. 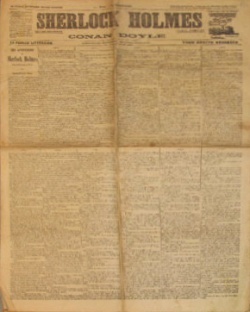 However, in july 1910, the newspaper was dedicated to Arthur Conan Doyle and published 6 short stories of Sherlock Holmes, in French. This page was last edited on 8 June 2016, at 09:37.